A bed bugs bite is actually a skin puncture. Some people have an allergic reaction to the fluids injected by the bed bug while others do not. The allergic reaction to the bite can be small such as some skin redness or small bumps (called ulticaria papules) to more severe reactions such as skin blisters. The bites are not dangerous, but might itch. They can be found as single bites, in lines or clusters on exposed skin areas such as the legs, arms and neck. It is rare for a bedbug to bite the face or bottoms of the feet. Bed bug bites will heal on their own in 3 to 5 days if left alone. If scratched, infections can form. Bite reactions can vary from episode to episode with some people seeing an increased reaction, while others may see a smaller reaction. These insects do not transmit disease to humans. Many people ask "do bed bugs bite." Well not exactly. The rostrum or projection from the bedbugs head is composed of right and left halves of the mandibles (lower jaw) and maxillae (upper jaw) and a labium. These maxillary and mandibular structures are fused together when the insect is alive and retained in the singular labium, a hinged oral structure that acts as a sheath for the single stylet fascicle. The stylet moves slowly up and down until a blood vessel is located. There is a dorsal slit through which the fascicle leaves the sheath (appears ventral because the labium is angled back from the head when being carried and not feeding). Within the fascicle is a large maxillary canal through which blood is sucked up and a smaller one through which saliva travels. A Bed Bug is sucking and not sipping when withdrawing blood from the human host. During a bed bugs bite, the bed bug injects an anesthetic/anticoagulant compounds into the human host. An allergic reaction to these compounds cause bed bug bite symptoms as you can see in these pics of bedbug bites. You can also see bed bug bite marks, which is a clear center where the skin was punctured. A bed bugs bite often resembles and is confused with a mosquito or flea bite. However, there will often be multiple bites in one area, creating a rash. Bites may look pink or red and may create a small welt on the body. When a bed bug bites, they leave behind some saliva. It is the allergic reaction to the saliva that caused the bite mark or rash. Because bed bugs bite resemble the bites of other insects and other kinds of rashes, you may not realize right away that you have bed bugs. A doctor might even misdiagnose the bed bug symptoms. Over time, it is possible to become less sensitive or more sensitive to a bed bugs bite. Here are several pictures of bed bug bites for comparison to your bite marks. Bed bugs are normally nocturnal and feeding takes place late at night through early morning hours, but bed bugs can feed during daylight hours, too. 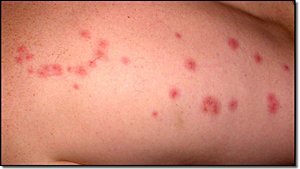 Often bed bug bites can be single but can be multiple and form a pattern. There are many reasons why bites are clustered close together. 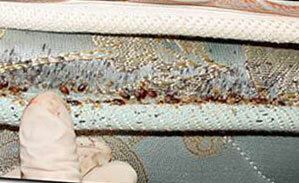 Bed bugs hide in mattress bed seams or folds. If your arm or leg is along one of these seams, any bedbugs hiding will move to the closest skin area along the mattress seam line, often in a pattern of 3 bites (called the breakfast, lunch and dinner pattern). They will not move because you move during feeding unless for some reason the stylet fascicle doesn't allow blood to be sucked up into the bed bug's gut. In allergic people, a bed bugs bite reaction will appear at each bite location. Bites are often in groups of 3, but not always. Patterns are considered to be random. It is not unusual for only one bite to occur. In most people a minor reaction occurs referred to as urticarial papules (slightly elevated skin patches or wheals). The skin that surrounds the bites suffers from severe itch. Each bite will have a small center spot that is lighter in color than the surrounding area (the site of the bed bugs bite, also called a hemorrhagic puncta). The irritated area may appear as a purplish skin spot or patch (called a purpuric macule) be raised above the skin. Skin areas can also appear swollen along with the severe itching (called a wheal or skin welt). 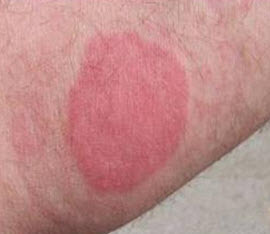 Other bed bugs bite symptoms can include elevated fluid filled skin areas called vesicles or bullea (fluid filled skin blister). There can be delayed skin reactions that occur in 1 to 3 days. 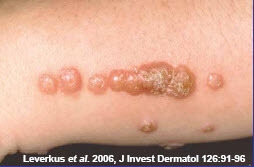 Once the skin reaction appears, the duration of symptoms, including itch is 2 to 5 days. Bed bugs bite on exposed skin areas. They will not bite through clothing, so wearing socks over the bottom of pajamas is one way to prevent bed bug bites on buttocks or other areas of the body. Do bed bugs bite your buttocks? The answer is yes if this skin area is exposed when sleeping. If bites are only on the buttocks and no where else on the body, it is likely that the cause is not a bed bug since other skin areas such as the lower arms or legs are generally more accessible. No treatment is usually required for a bedbugs bite. If you scratch the bite so that it breaks the skin, you could develop a secondary infection. If the area of the bite becomes redder and redder or otherwise appears infected, see your doctor. Antibiotics may be needed. The bottom line – don’t scratch the bites. You should also wash the affected area with an antiseptic soap to help prevent infection. 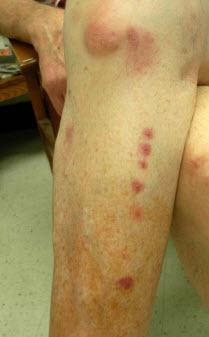 Bed bugs bite can cause severe itching. That’s because when bedbugs bite, they inject a chemical under your skin that prevents blood from clotting. The itching may require treatment. If the itch is bothering you, an itch cream made specifically for bed bug bites or an over the counter general insect itch product such as Aveeno or a product that contains camphor and menthol such as Sama could help (tip: keep the Sama refrigerated). You can use calamine lotion or any other over-the-counter product designed to prevent itching and treat insect bites. You can also try an over-the-counter antihistamine like Benadryl. That will treat the allergic reaction that is causing the itching. A topical corticosteroid may also bring some relief. If there is too much swelling around the bed bugs bite as indicated in the bed bug bites photos, you can apply an ice pack. This will reduce the swelling and will probably help with the itching, as well. When making a diagnosis of bed bug symptoms, a Doctor will seek to differentiate bite reactions from other possible causes. If a Doctor believes that there may an alternative cause for skin lesions, a skin biopsy may be needed to confirm the diagnosis. Gianotti-Crosti syndrome: flat topped skin papules (firm bumps on skin) that are not itchy on the face, buttocks and limbs. Can be caused by a virus in young children. transient acantholytic dermatosis (also called Grovers disease): skin disease with small red itchy spots. Occurs due to heat stress. Bed bug bites are often confused with bites from other insects and parasites such as mosquito bites. It is almost impossible to tell one from the other. Mosquito bites tend to be randomly distributed, while bed bug bites are in distinct patterns on areas of the body exposed during sleep. 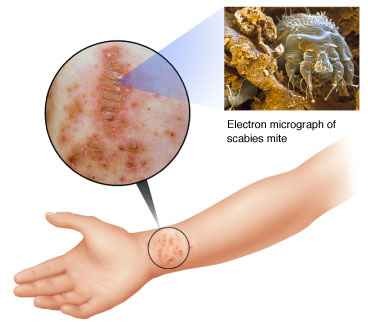 Scabies is another insect that causes skin irritation. Problems are usually seen on the lower legs, bottoms of the feet, waist and can be the cause of bug bites on buttocks. There are no recorded cases of bed bugs spreading disease to humans. Several diseases can incubate inside bed bugs including yersinia, tularemia, rickettsia, relapsing fever, Q fever, pasturella plague, leprosy, leishmaniasis, brucellosis, MRSA, hepatitis B virus, human immunodeficiency virus and American trypanosomiasis. Again there is no evidence of bed bugs spreading disease. Use a flashlight and magnifying glass to find where the bed bugs are hiding. You will be able to see both the bugs and their remains without any magnifying glass as an adult bug is 1/4 inch long. You can see areas where they have been by looking for a reddish-brown spot on your mattress. Look in the mattress cracks. Look under every surface and crack in your home including the inside of any printed materials in your room such as a newspaper or magazine. it is possible for the bugs to move from one room to the other. Every inch of the room needs to be inspected, cleaned or treated. 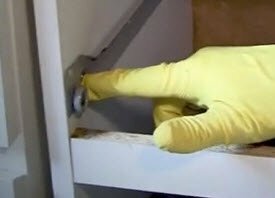 Select a safe area outside the room to be cleaned such as in a hallway. This is where you will place treated items. Treatment will start in one area of the room, where your bed is located. When inspecting or treating items, try and do it in one place to avoid spreading bed bugs throughout the room. Start with the linen on the bed. All linen will need to be cleaned in the wash on the hot water setting following by 20 minutes in the dryer. Fold the linen on the bed and place in a plastic bag, preferably a Ziploc Big Bag, as these are bed bug proof and low cost As an alternative, transport in a plastic container with a lid that snaps on. Throw out any disposable items such as magazines and newspapers. Bed bugs could easily hide in seams or between pages. The vacuum is a handy way to pick up bed bugs. Vacuum all areas of the mattress using a brushless crevice tool (or hose if your vacuum doesn't have one). Avoid the brush attachment since bed bugs could hide/get trapped in the brush. Treat the mattress with a bed bug safe spray. The seams and cracks in your mattress are excellent places for bed bugs to hide. If you prefer to to use a natural bed bug treatment to spray any places where you feel the bed bugs may be hiding, then considering using Bug Patrol, natural product that uses plant extract to kill bed bugs and bedbug eggs within seconds after contact. This product has a slight cinnamon smell. When using either of these products be sure to apply according to the manufacturers directions. A quality mattress safe insecticide based spray is Sterifab. Be sure to spray along seams, buttons and particularly look under any mattress tags or labels, a favorite hiding place for bed bugs. When done, move the mattress into the safe area. For extra protection use a hand steamer along all seams. Steam is an effective way to kill bed bug eggs. Remove drawers from any night tables and place on top of box spring. Look under the drawers. Treat any cracks or seams with one of the bed bug spray products. If treating wood, always test first on an out of sight area to avoid staining. Any clothes in the drawers should be placed in a sealed Ziploc bag or container and then washed in hot water as indicated above. Inspect other furniture as well. You should also clean the head board and box spring. Start with box spring, treating all surfaces with the mattress safe spray such as the Bed Bug Patrol or Sterifab mentioned above. Open the bottom of the box spring by either removing or peeling back the cloth that is tacked to the bottom. Spray inside the box spring. When done, considering spreading some natural Fossil Dust inside the box spring and then reseal the bottom cloth (or throw it out). When done, move the box spring to the safe area. These are favorite hiding places for bed bugs, particularly if your bed frame is made of wood. Treat all cracks in the bed frame with Sterifab or a crack and crevice spray such as Phantom or Bedlam. If you can/to be safe, take apart the frame or loosen bolts and treat inside each crack and joint. Treat the bed frame. If bolted to the wall, remove and treat. Move both into the safe area when done. Also treat any pictures frames, particularly in the backs of the frame. Bed bugs can hide in electronics. The only way to treat electrical items is to purchase a PackTite case, which will heat the items to the required 114F, assuming this heat level doesn't cause damage to the item. The more bed bugs you can vacuum up the better. Vacuum all the cracks in your room until the infestation is gone. Remove the vacuum bag in the room being treated and wrap in a sealed plastic bag during disposal. Use the crevice tool (no brush) around the edges of the room. As mentioned, a hand steamer will also effectively kill bedbugs and their eggs. Steam cracks, crevices and places where you see clusters of white bedbug eggs. Use a natural dust product under the furniture, inside the box spring and along the cracks of the wall. The dust will attach to any late hatching bedbugs from eggs that you might have missed. Move the bed 6 inches from the wall and any furniture when done. Put a climbup receptor under each bed leg to trap any bedbugs heading toward the bed. An empty receptor after a week is a good indication that the bedbug problem is gone. It will also give you a good idea as to the size of an infestation. Place some talcum powder into each receptor bowl. The powder will stick to the back of the bed bug, eventually killing any that were trapped. You may need 2 or 3 treatments to avoid another bed bugs bite problem. Be patient, thorough and use the right combination of products (spray, dust, vacuum, hand steamer) and bed bugs bite issues will be a thing of the past. 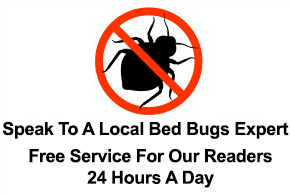 It is always preferable to call in a professional to avoid more bed bugs bite problems. A national network such as Home Advisor or call elocal at (877) 673-2704 is a good place to start. The advantage of this approach is that members of the network are pre-screened, are licensed and insured, and offer callers four free quotes. Compare a national firm to a local one. You can find one by using our local list of bed bug pest control experts. Follow these tips and you'll never suffer from a bed bugs bite again. Wondering if these are bed bugs bites? Free brochures for download with additional bed bugs pictures and information. Descriptions and Picture of Bed Bug Bites. List of other possible causes for symptoms. Guide to the identification and treatment of bed bugs bites and infestations. Written by: Dini M. Miller, PhD.